UPADATE – After a series of setbacks this event was pushed back from its June date and is now scheduled to take place on October 3, 2014. 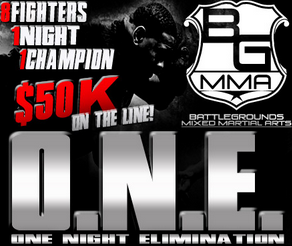 It is reported that the Oklahoma State Athletic Commission has approved a one night, 8 man elimination MMA tournament. Promoted as the “Battlegrounds ONE Tournament” it is advertised as “ the most grueling and punishing tournament in sports”. As a fan whose first exposure to MMA was the old tournament format popularized by the UFC of the 1990’s I have some nostalgia for such events, however, given modern government regulation of the sport my interests quickly shift to the legal overview of such an event. Despite reports that the format has been approved and the letter from promoter Brian O’Rourke requesting rule changes to allow such an event being publicly available, a review of the presently published Oklahoma State Athletic Rules (Title 92 – General Agency Rules) don’t explain how such a format can be sanctioned. Looking to Subchapter 7 of the published Oklahoma Rules elimination rules are specifically allowed, however, among the requirements are mandatory 16 oz boxing gloves, headgear, and 3 one minute rounds. Interestingly the request for approval of this event states that the suggested rule changes allowing one night elimination MMA tournaments “has been compiled with major contributions form some of the leading surgical physicians of impact and combat sports nationwide“. rounds. This makes the second round “playing field” unequal. o In the case of MMA, orthopedic injuries are more likely to occur. cerebral bleeding, or second impact syndrome. theoretically increasing the risk of blood vessel clots, dissections and brain injury. I cannot find any provisions that speak to one night elimination tournaments for MMA. Perhaps I am missing something, can you point me to the specific link containing the rules and point out the relevant subsections? The entirety of Chapter 11 covers the rules for mma. Each bout is viewed as a separate bout to itself. We have no rule in place preventing an mma fighter from competing on consecutive days or on the same night.